Ever since Samsung showcased its foldable smartphone design at the Samsung Developer Conference back in November last year, the news cycles have been churning about foldable concepts from other major phone brands. But, there is another company that seems to be working behind the scenes on the most unique concept yet. Intel, computer hardware manufacturer, filed a patent back in 2017, as spotted by LetsGo Digital, for a foldable phone concept never seen before. This design shows a two-fold mechanism using which the device bends into a compact form factor. You can expand it twice to convert it into a large tablet-like device, convenient enough for all your needs. 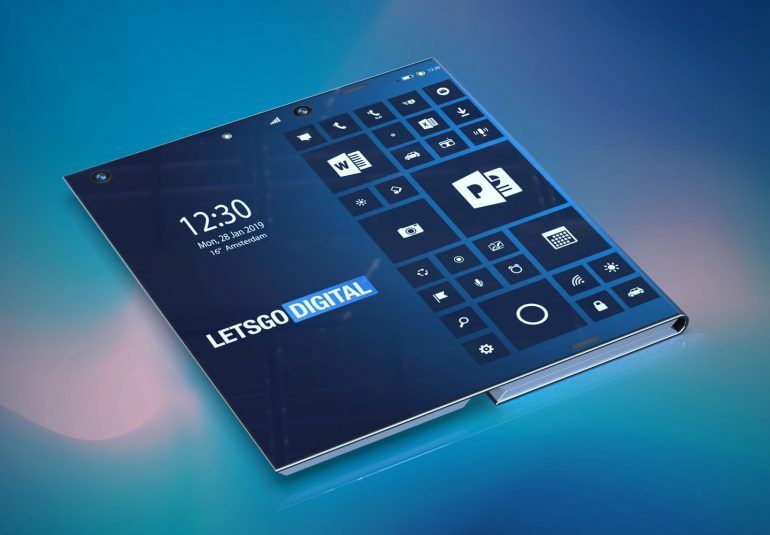 This mockup, designed by LetsGo Digital, shows a Windows Mobile-like software running on the device making us think that Intel will probably license the technology to Microsoft. The patent drawings show a laptop mode as well as an e-reader mode, coupled with the usual phone mode, offering users with the best of all worlds. If indeed this concept comes to life, it would be interesting to see it with the designs from Samsung and Xiaomi, both of which are unique in their own sense.